Baja Trail Rider shot this video of the Wilderness Trail. It took 20 days to route. Looks fun! Great... that link and the two more videos that follow really show how dirt bikes can explore abandoned roads and other areas better than 4x4s and leave virtually no trace as they ride between the little bushes and not over them like a Jeep would need to. Larry is cool, isn't he? We looked for that route over 25 years as new rancho blocked entrance. So we did not remember how to get in there from years ago. As luck would have it Garcia brothers the big ranching out fit owns the rancho. So One of them close friend. The guard at the entrance would not let us pass lucky me Cel worked. Put him on phone with his boss now we have permission anytime. We even found a cabin that I have a picture of from 25 years ago. The wilderness trail very cool ride. What area is this trail in? the wilderness trail is where? "wilderness" with cell service. how convenient. 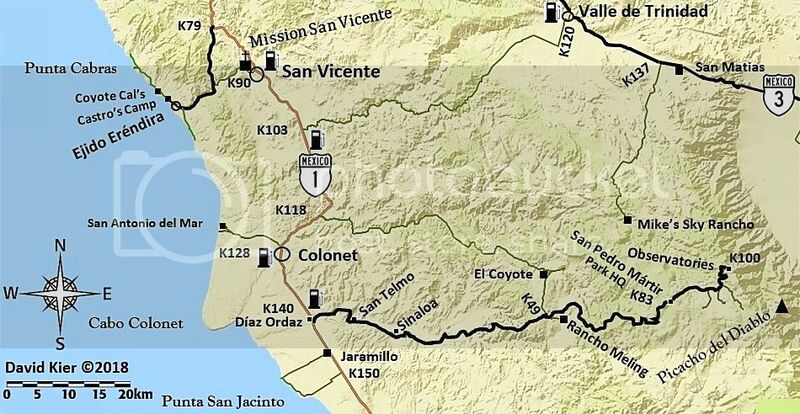 Where is this "wilderness trail" in Baja exactly (or approximately) ? maybe wilderness doesn't mean what some think it means. Going riding with Larry is more like going " Into The Wild" Many go in but only a few come out. Larry does not like his riding guests to map the trails with a GPS so lets just say that Larry is not going to be giving out GPS points anytime soon. I think its safe to say the trail in near his home town of San Vicente. But I'm sure it was a wonderful ride! Sorry been out making another new trail. The wilderness Trail is way South of San Vicente takes you up into forest Melings. Yes his gopro too low as he was ducking brush. On next two videos we adjusted it up. Like Dirk said I don't use GPS but do know where I'm going. My cell worked near the Highway. Where I called owner of rancho He used Other means to contact Guard. As far as name of trail it is good name as it is in middle of nowhere JAAAA. It was a road at one time but only cows keep in open. The start of it was mining road from 50 years ago as I was told by rancher. Trail runs West to east we looked for route over 25 years ago. Always had to return the way we came in. At one point in tight canyon it got late searching for route. So we put marker on trail end. Got back to the Old Mill hotel then next morn found a canyon that looked like same one. Five miles in found marker Then had to pile up rocks in few places to get past stair steps. It might be in here! David it starts south of Camalú, then heads east . As I stated before 25 years ago there was no rancho. So years later we looked for route again always ended up at rancho. They changed the landscape to the point we could not remember route. Even that I have pictures from 25 years ago. Once you get up but below forest its dirt road to melings then Coyotes. I could draw a map but I don't want to post it and have big groups show up. I cant even find it on google earth because its so over grown. Just come over David I will have a small bike waiting for you. Thanks amigo! That would be fun! I can probably handle a 250 4 stroke, lol! David I have a CRF230f with CRF150 wheels 16in/19in. Or I can put the 18in/21in back on easy ride bike.